Previously released as an Import Blu-Ray/Region A (2009) and HD DVD (2007), Eternal Sunshine of the Spotless Mind will be available in North America on Blu-ray January 25, 2011. The disc will contain quite a few extras, including “A Look Inside Eternal Sunshine of the Spotless Mind,” “A Conversation with Jim Carrey and Michel Gondry,” pocket BLU, and other featurettes. (See list below). In Eternal Sunshine of the Spotless Mind, Joel (Jim Carrey) is stunned to discover that his girlfriend, Clementine (Kate Winslet), has had their tumultuous relationship erased from her mind. Out of desperation, he contacts the inventor of the process, Dr. Howard Mierzwiak (Tom Wilkinson), to get the same treatment. But as his memories of Clementine begin to fade, Joel suddenly realizes how much he still loves her. 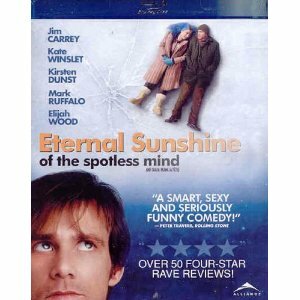 Pre-order Eternal Sunshine of the Spotless Mind for $19.99 (List $26.99) and get $4 worth of eligible movies and TV shows from Amazon Video On Demand.